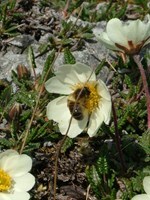 Bees feed on pollen and nectar. The honey bee lives an average of 21 days, and then dies. The queen bee can live up to a year or more. Although a single bee travels approximately 55,000 miles during its life time, each bee produces only about one tenth of one teaspoon of honey. So the production of honey for our tastes and needs requires colonies of bees. However, bees do more, much more than merely produce honey. Bees are the foremost pollinators of the crops that we grow. About every third mouthful we eat is food that is dependent on bees. It is true that dairy produce such as milk, butter and cheese do not come from crops, but even grass is indirectly reliant on bees since grass requires nitrogen in the soil that is produced by clover that does depends on bees for its pollination. In recent years bee colonies around the world have been collapsing at an unprecedented rate, a rate that is alarming many food producers because it affects every crop that depends directly or indirectly on bees for pollination. Many beekeepers have lost all or some of their hives. The phenomenon is called 'colony collapse disorder' and is recorded in Europe, Asia and the United States. In parts of China, the bee has disappeared altogether, and pollination now has to be done by hand which is labour intensive and takes much much longer. At present this is done efficiently and 'free of charge' by bees. But some scientists believe that if bees continue to die out at the present rate, bees may disappear altogether within a few years. Why the Decline in Bees? Scientists simply do not know why bees are dying out. Researchers have looked at viruses, parasites, insecticides, malnutrition and other environmental factors but have been unable to pinpoint a specific cause for the decline of bees. Under normal conditions 10% of bee colonies are lost in winter, and a harsh winter is likely to accentuate the problem but official data are showing beehive losses of approx. 29% in 2009, following losses of 36% in 2008 and 32% in 2007. Destruction of habitat, increasing monoculture and greater use of pesticides on crops could be contributing factors to the bee decline. Habitat is being destroyed as more land is given to agriculture and development. Monoculture is where a single crop is grown but one of the problems with this is that bees can then feed only on a limited form of food so that their immune system is weakened to such an extent that they cannot withstand viruses and diseases. The bees are also often the victims of pesticides which are sprayed on the crops to kill other pests. Ironically, the decline in bees in part stems from the expansion of agriculture to feed people, but destroying bee populations can hurt the very crops that growers are trying to optimise: Growing more food means that we need pollinators! The best thing to help bees survive, say scientists is to try to limit the destruction of bee habitats, the characteristic places where bees thrive. Bee habitats which contain a rich biodiversity enable the bees to feed on wide variety of shrub and tree blossoms and wild flowers so that they build up strong immune systems that protect them against viruses and disease. You can make your garden an attractive place for bees, butterflies and other insects simply by planting herbs which you will also be able to use in your cooking. In Ireland, the following herbs are excellent for bees, butterflies, and hoverflies: angelica (angelica archangelica), chives (allium schoenoprasum), fennel (foeniculum vulgare), lavender (lavandula augustifolia), thyme(thymus sp), mint (mentha sp), rosemary (rosmarinus officinalis) and marjoram/oregano (origanum vulgare).